If you downloaded the IT Assets Database before 12/26/2018 you will have version 1. If so, please follow the instructions here to update to version 2 of the IT Assets Database. this module allows you to create checklist for Servers, Workstations and Users. A checklist can include scripts and links as well as text fields. Please refer to the Checklist section of the manual for details. if the pre-filter checkbox exists on a form the system will filter out the source-view additionally via the column “DefaultHideFromSearch” (=0), this is defined in the source views in SQL. Those view might retrieve this information from a central table or determine the column dynamically via the underlying data. The whole function is mainly to filter out retired/inactive records per default from the searches in various places. The longer you use the database the more data will be stored in it, this has a negative performance impact and / or might even clutter up the views and searches. The checkbox is set by default until you manually deselect it. if you are using a full version of Microsoft Access, you saw the navigation pane and menu ribbons of Microsoft Access by default. This is now hidden by default, instead you will see a button “Show Tables” (depending on the right to see SysConfig in the application users – if you can’t see this button you won’t see the Show Tables button either – making it more secure as well), to show those menus again. Please be aware – the update will wipe out your SysColumns table and reset it to default. If you changed anything in this table to adjust the searches and listboxes, you will need to do this again. Further will there be some adjustments to certain records in some system tables (tblDatabaseStatus, tblDeploymentStatus, tblProjectsDisposition, tblPurchaseItemStatus, tblPurchaseStatus). If you did not make changes directly in those tables (not possible via the regular application) you might need to review them. Please refer to the SysConfig section of the manual for more details about them. And go to the Download section to download the newest version of the front end application as well. Once you downloaded both files, please first create a backup of your current Microsoft Access front end application – you simply can rename the two files “IT_Assets_Program.accdb” and “IT_Assets_Program_DEV.accdb” to something else or copy them somewhere else as a backup. Now open the new IT Assets Database zip file and extract the same two files from the ZIP file to your program source directory – DO NOT YET OPEN THE PROGRAM! 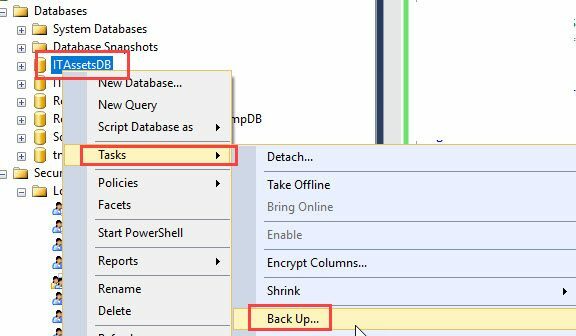 Open your SQL Server Management Studio and create a backup of your database while right clicking on your database and selecting Back up… under Tasks in the context menu. 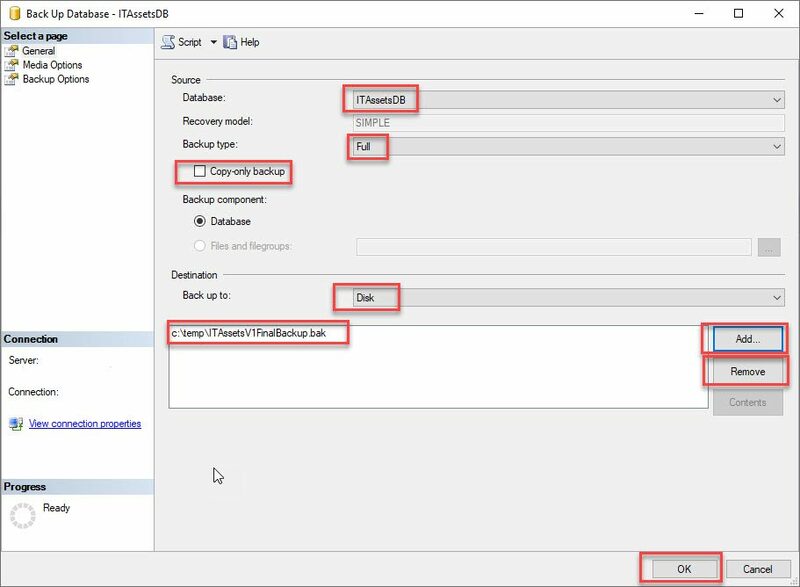 Remove any existing backup destinations and add a new backup destination – naming the file ITAssetsV1FinalBackup.bak via the ADD button. Make sure you select the right database and backup type full. Now open the file SchemaUpdate.sql from the ITAssetsDBv1-to-v2-SchemaUpdate.zip via SSMS (SQL Server Management Studio). Click anywhere in to the script window to make it active and make sure you have the right database selected in the upper left toolbar menu. After you open the script and selected the right database, click on EXECUTE in the toolbar (as indicated in the picture with an arrow) to execute the update script. This will take about a minute or more, depending on the size of your database. Once the script is finished you will see a output log in the message tab, scroll all the way to the bottom – you should not see any errors there. If this all finished correct – you can now open the IT_Assets_Program.accdb directly in the program folder. Since this is the first start of the new front end, it will ask you again for connection information to the database, like described in the Installation section of the manual. Simply inform the program about the SQL connection information, it should not create a new user nor should you need to change anything else in this setup assistant. It will reconnect the front end to the database. Next please go to the Users menu and give yourself the rights you might miss – so you see the new sections in the program. Close the program and open it as usual (like you did before) – you will see some new buttons and menus. Please note – if the SQL script failed you might want to gather some information of what failed and use the contact form to let me know what did go wrong. I will do my best to resolve the issues. Meanwhile you probably want to restore the previously created backup of your database.